I've known about BrickBash for awhile now. A few years back (maybe 2005 or 2006), a few friends from COLTC went up to Michigan to help out Duane Collicott. I couldn't attend that year, but sent along empty LEGO buckets (to make into stanchions) for the event. If you get a chance and live within driving distance of Ann Arbor, add BrickBash to your schedule; it's a annual one-day free LEGO event centered around LEGO & education... and from the pictures, it looks like a nice place to hang out with AFOLs for the day. 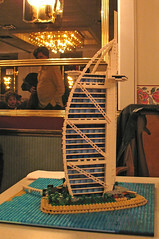 And what can I say about this microscale skyscraper, but "WOW!"